“If it’s not a psychoactive drug, you can’t get addicted to it…right?” You may have heard someone make this claim before, and if you have, please note right off the bat that this is a fallacy. While drugs of all kinds present their problems and crippling potential for physical and mental addiction, there are actually many things that we encounter in our daily lives that can be used excessively to the point of addiction. And, while watching too much television or drinking too much soda pop might not be as immediately life-threatening as an opiate addiction, for example, the addiction recovery specialists at Front Range Clinic in Fort Collins believe that more people should be aware of the many facets of addiction. Even seemingly harmless yet unhealthy habits are important to address in one’s life in order to be healthy. Of course, our Fort Collins drug rehabilitation services don’t want to come across as preachy or judgmental by scolding some of the things that you love in life. While it would be hypocritical to condone personal drug use, we do understand and acknowledge that many unhealthy things in life can be safely and responsibly enjoyed if kept in strict moderation. Just like balancing junk food with a healthy diet and exercise, using discipline to moderate what you put into your body and how you spend your time can lead to very positive outcomes. In the interest of furthering people’s knowledge about non-drug related addictions, our Fort Collins addiction rehabilitation clinic is going to cover other forms of addiction that affect many people but don’t get taken as seriously. If you’re seeking help with drug addiction, obesity and related eating disorders or you’re just looking to break an unhealthy habit that’s causing you trouble, reach out to Front Range Clinic today. Our supportive, non-judgemental addiction recovery services can and will help. Now that we’ve extensively touched on the nature of behavioral addictions, let’s take a look at some specific addictions. Gambling closely resembles that of drug and alcohol addictions. The thrill of winning releases the same feel-good chemicals in the brain that drugs also trigger, and the risk of betting your money is an exciting component of the gambling experience for people. Unfortunately, gambling addictions often result in crippling financial debt, bankruptcy, divorce, and other financial or relationship-based complications. Treatment for gambling disorder is usually included in the same type of therapy settings as drug and alcohol abuse. Buying things is necessary in our society, but when multiple credit cards are maxed out and you have more clothes and material possessions than you know what to do with, you might have a problem. Individuals addicted to shopping tend to purchase items just to avoid feeling sad, but then feel guilty afterward. Treatment for shopping addiction typically involves behavioral therapy and counseling. We’re not trying to demonize video games here, as moderate amounts of gaming and spending time interacting with a screen are fine. However, spending excessive quantities of time gaming and having trouble distinguishing fantasy from reality can be problematic. Though excessive gaming’s long-term effects on things like attention span and cognition are unclear, people have experienced negative consequences as a result of gaming. 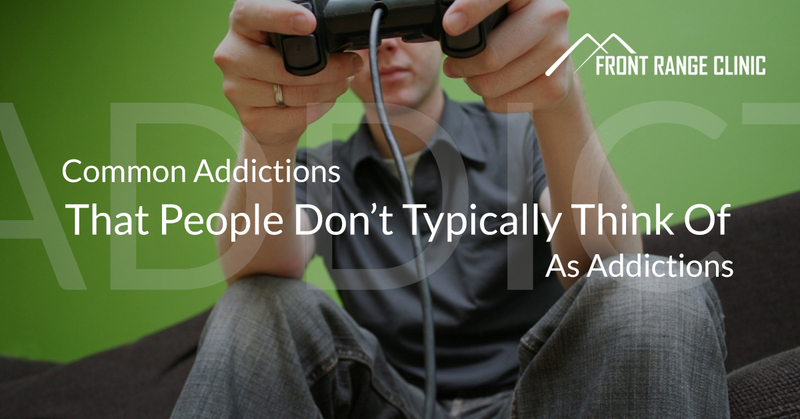 Treatment for gaming addiction generally involves counseling and behavior modification. Food is, of course, a necessary part of life – we literally need to eat and drink in order to survive. However, if you’re eating to ease emotions, stuffing yourself to the brink of nausea when you’re alone or feeling guilty after a binge, these are signs of binge eating disorder. Front Range Clinic can help address issues related to eating. With nine locations between Fort Collins and Pueblo, Front Range Clinic is dedicated to helping our Colorado community stay healthy and strong. Learn more about the best drug rehabilitation services in Fort Collins by contacting us today.